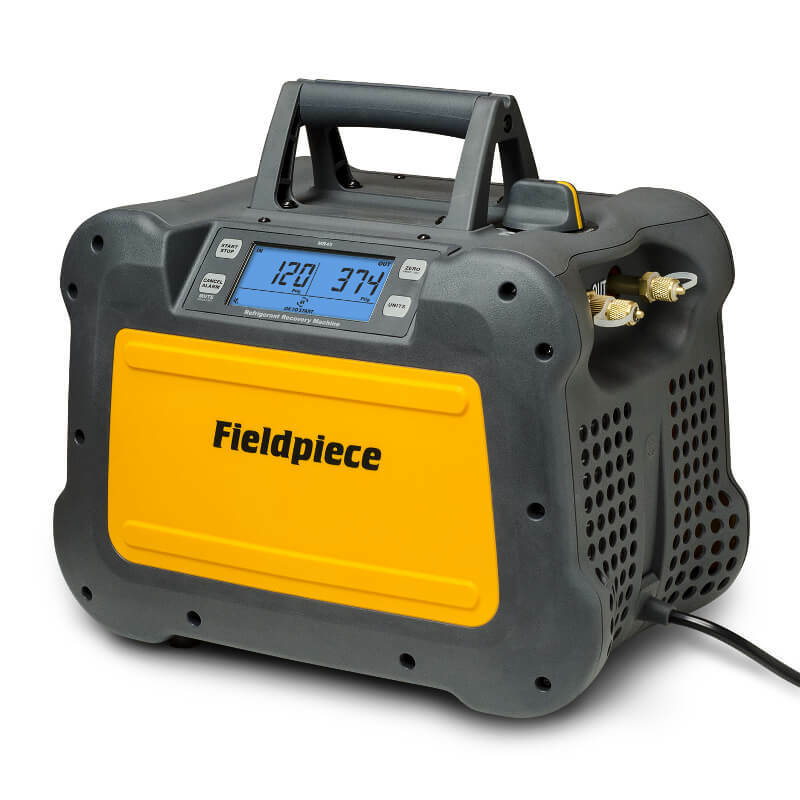 Fieldpiece MR45 Digital Refrigerant Recovery Machine with Fast Speed Action features an extra-large condenser for excellent cooling, a single dial self-purge, an easy-to-read backlit display, easy to access ports, and an overall build that only weighs 22lbs. It is also equipped with an onboard monitoring system to slow down while handling liquid and speed up while handling vapor in order to achieve maximum efficiency. The Fieldpiece MR45 handles itself against power surges and drops, rain, and hot environments, so it is always ready to serve you. 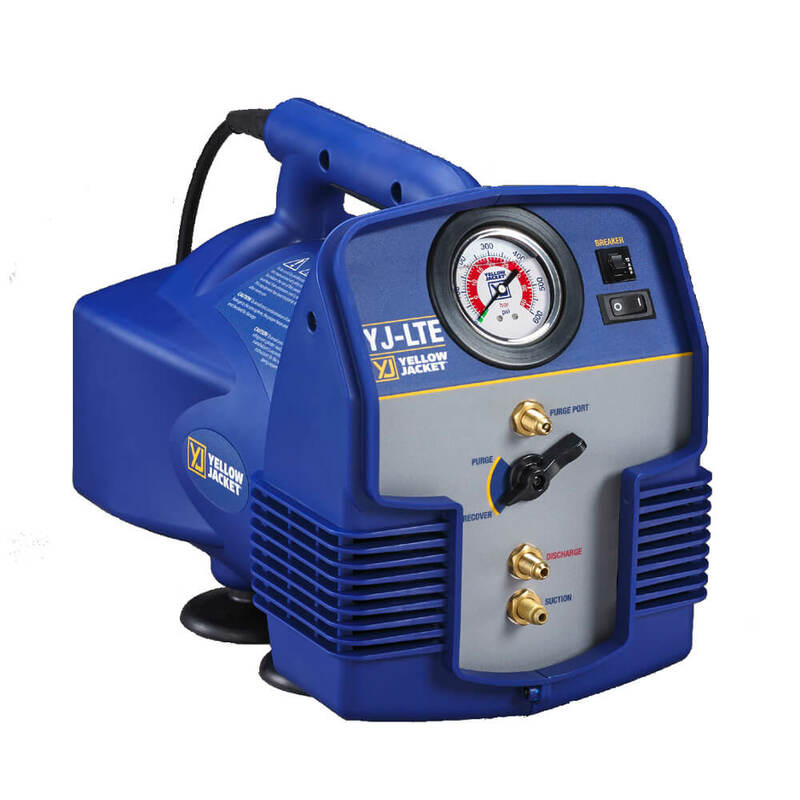 Fieldpiece MR45 refrigerant recovery machine with fast speed action is a long lasting, tough recovery machine built with low friction ceramic cylinders, dual cylinder compressors, and an extra-large condenser for exceptional cooling. 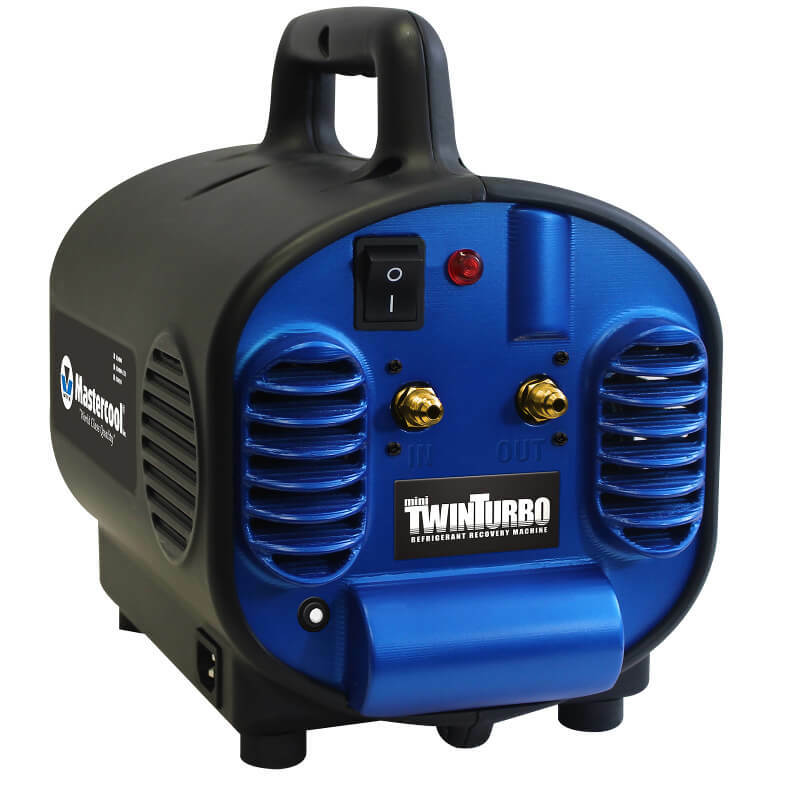 The MR45 digital recovery machine is also equipped with a smart variable speed 1HP DC motor. These features allow this recovery machine to perform exceptionally well on jobs that are longer and hotter. 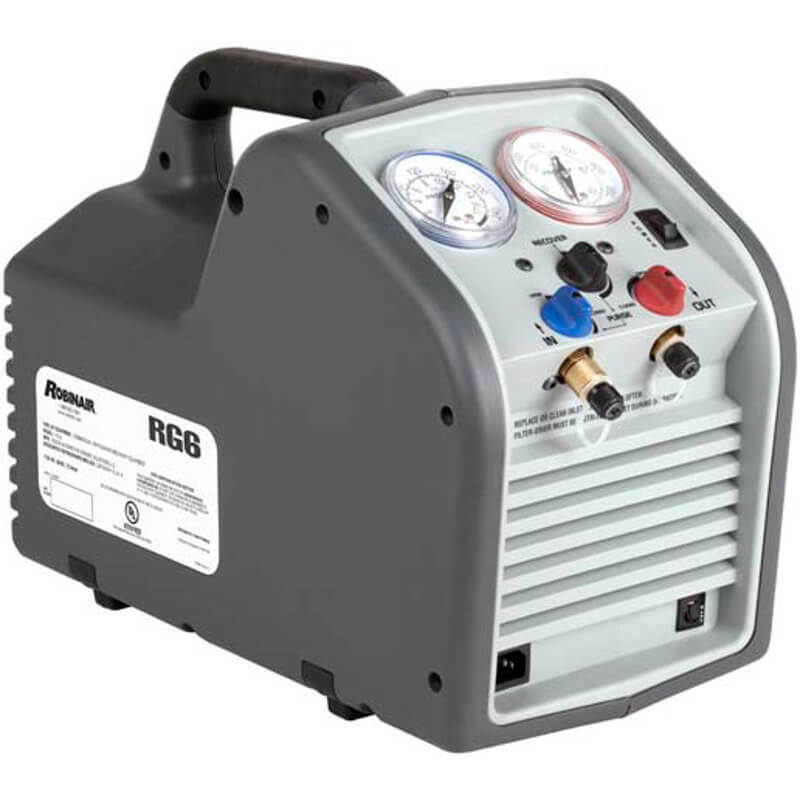 The MR45 recovery machine is designed so that the variable speed DC motor adjusts its performance to handle liquid smoothly and then ramp up to 3,300 rpm when it senses vapor. The Fieldpiece refrigerant recovery machine’s large condenser has been designed to cool the refrigerant faster, allowing for a faster and more efficient recovery operation which is especially beneficial on hot days. This digital recovery machine is designed to still provide full power even in locations where voltage drop is a problem. It can still run even on low power of up to 95V AC. 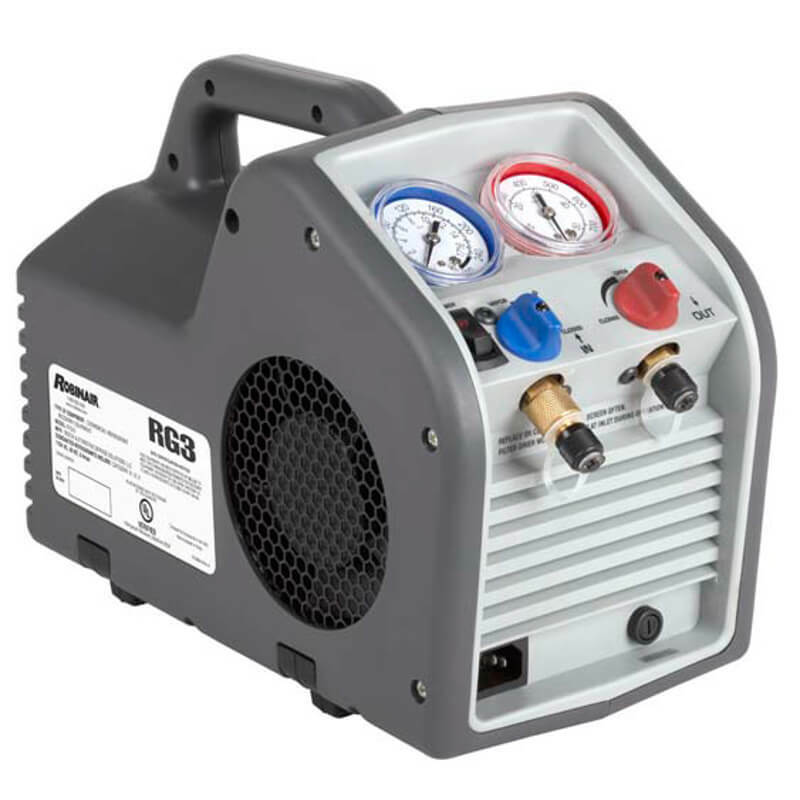 The MR45 has many features that have been designed with the HVAC professional in mind: the case, display, and electronics have been designed to withstand environmental hazards, direct access to ports for easy hose connections, a large rubberized dual-port dial operation, and an easy to read backlit digital display that provides large micron and pressure readings, along with status messages for ease of use. 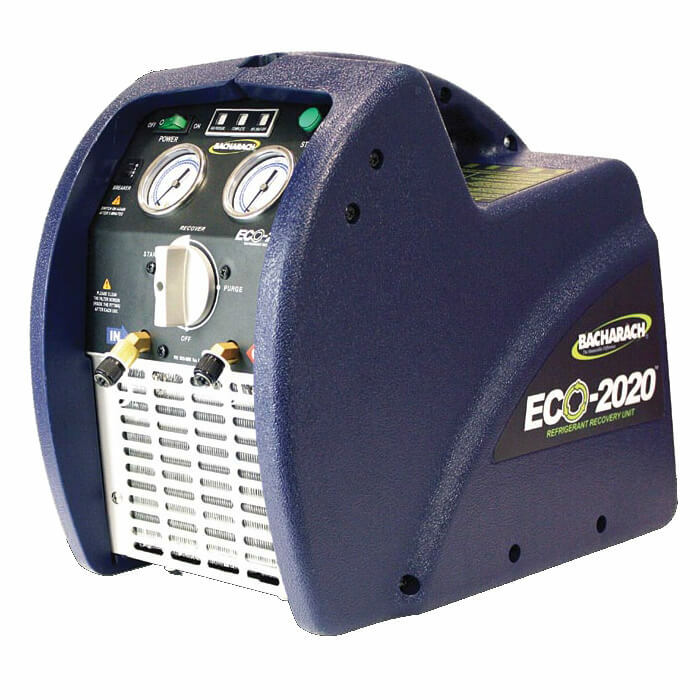 In addition, the lightweight (22 lbs) unit is an extremely portable machine to carry at a job location. The easy to use single knob has two operational modes recovery and purge. During recovery, the MR45 will automatically stop after vacuum reaches 10’Hg for 10 seconds. The technician can then set the knob to purge to pump the last traces of refrigerant into the recovery cylinder instead of being left in the machine or released into the environment. The Fieldpiece MR45 is UL verified to section 608 of EPA Clean Air Act and UL Verified to AHRI Standard 740.